After traversing the globe competing against the top bowlers in the world over a span of two years, England’s Dom Barrett and Danielle McEwan of Stony Point, N.Y., emerged as the winners of the World Bowling Tour Men’s and Women’s Finals at Woodland Bowl. 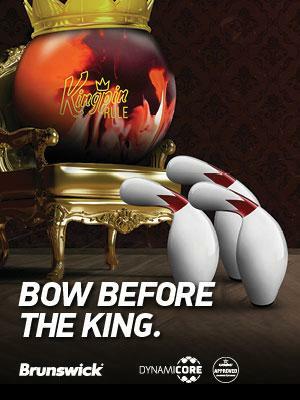 The finals, presented by the Professional Bowlers Association, aired Sunday on ESPN. Using an experimental World Bowling scoring system, Barrett, a four-time PBA Tour champion and top qualifier for the three-man finals, rolled a one-of-a-kind perfect game in defeating five-time PBA Tour winner Mike Fagan of Berkley, Calif., 300-256, to win his first WBT Finals championship. The unique WBT scoring system retained the traditional 10-frame scoring format, but awarded 30 pins for a strike, 10 pins for a spare plus the pinfall of the first shot in the frame, and actual pinfall for an open frame. For a spare, for example, if the player knocked down eight pins on his/her first ball and then converted the spare, he/she earned 18 pins for the frame. If a player left a split or missed a spare and got only nine pins for both shots in the frame, his/her score for that frame was nine. Various versions of bowling’s traditional scoring system have been tested by World Bowling, the international governing body for tenpin bowling in the eyes of the International Olympic Committee, in an effort to create a scoring system that will be more easily understood by those who aren’t familiar with the traditional bowling system. An experimental “best frame” system – similar to the system golf uses in Ryder Cup competition – was showcased in last year’s WBT Finals held in Las Vegas. Barrett said he liked the idea behind the new scoring system. In the women’s final, McEwan won her first WBT Finals championship by defeating 2014 WBT Finals winner and 2016 top qualifier Kelly Kulick of Union, N.J., 256-243, throwing six strikes worth 30 pins each and four nine-count spares, each worth 19 pins. McEwan was able hold off Kulick who had one less strike, four nine-count spares and, the difference-maker, a seven-count spare. “It’s a long process to get here and that’s what makes the win all that much better, looking back on what I had to do to get there,” said McEwan, who also spoke in favor of the scoring system. “I liked it; it almost made me not pay attention to the score,” she said. “I didn’t watch my opponent as much because throwing a string of strikes didn’t matter. I just had to focus on each shot I made. In the men’s semifinal match Fagan defeated three-time reigning PBA Player of the Year Jason Belmonte, 265-256. Both players threw seven strikes in the match, but after Belmonte left the 4-10 split in his 10th frame and failed to convert, Fagan threw his seventh strike for the win. In the women’s semifinal, McEwan, the No. 2 qualifier, defeated No. 3 Liz Johnson of Cheektowaga, N.Y., 256-233, out-striking Johnson 6-4 for the difference. 1, Dom Barrett, England, *$30,000. 2, Mike Fagan, Berkley, Calif., $10,000. 3, Jason Belmonte, Australia, $5,000. Semifinal - Fagan def. Belmonte, 265-256. Final - Barrett def. Fagan, 300-256. 1, Danielle McEwan, Stony Point, N.Y., $20,000. 2, Kelly Kulick, Union, N.J., $10,000. 3, Liz Johnson, Cheektowaga, N.Y., $5,000. Semifinal – McEwan def. Johnson, 256-233. Final – McEwan def. Kulick, 256-243.